Supporting the Information Mapping strategy; SysViewSoft presents: Sys-Mining©; software oriented to help in automated documentation and maintenance of legacy applications environment. It's undeniable that Legacy development environments are granted with an inherent complexity that has growth and continues increasing in the course of time. The software applications becomes very large and complex. From time to time means a big pain for organizations; we are refering to rotation of technical resources assigned to maintain applications; the systems knowledge and skills are inversely proportional in the pass of time, the greater the time frame, less ability to manage the systems. Although, development teams need information regarding how applications in charge are building and its inter-relationships, the collection and analysis of that information, consumes the majority of the time that technical people invest for maintenance activities. 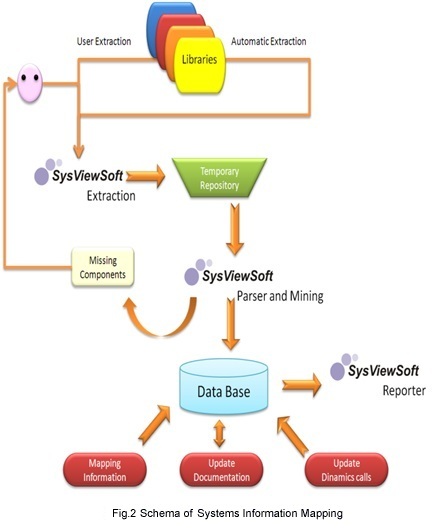 SysViewSoft supported in application mining methodologies, help legacy maintenance professionals to produce in an automatic way all the information related to application structure. The data gathered maps the current application structure and shows detailed graphics with the choice for printing. Sys-Mining© additonally becomes part of current documentation repository, Sys-Mining© allows the introduction of end user documentation in Sys-Mining©'s data base; this way we have all the application documentation centralized in one repository. Of course, we have the ability to query the information. The following diagram demonstrates the several stages of SysViewSoft Sys-Mining©. 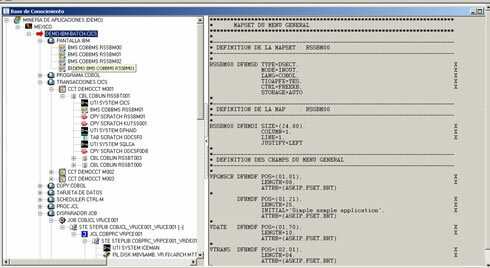 First we perform the connection to mainframe with the aim of collect the components that comprise the application libraries to inform. As an optional activity, the user can have the responsibility of component extraction and make the delivery with any other form. This stage could be performed in a periodic way, aiming to maintain the knowledge data base up to date. The collected components from mainframe or provided by end user will be parsed and integrated into knowledge data base of SysViewSoft Sys-Mining©. The referenced elements that were not located will be reported for a later incorporation. The elements referenced in dynamic way should be incorporated by means of an additional process and subject to controls. This stage could be executed periodically with the purpose of maintain updated the knowledge data base. Once all faces were finished, that is component extraction stages and mining performed, you have the generated knowledge data base that permits achieve the information mapping, that is, perform queries and lookups in order to help on application documentation. 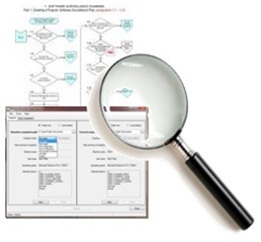 Shows components grouped by systems and subsystems, access source code (lookups), component diagram, lookups file and tables referenced by programs and subprograms, access inverse references and to the component flowchart (if applicable). 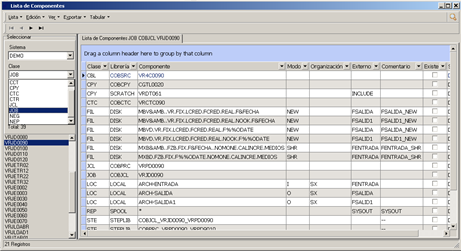 You can query components from a JCL: Programs, data sets, reports and so on. 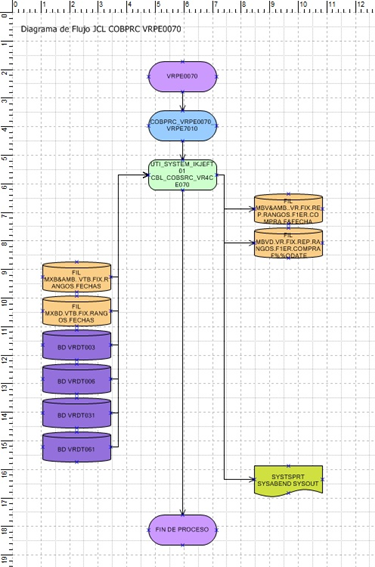 The flowchart of a JCL shows the distinct steps included into a JCL, and input/output data sets. 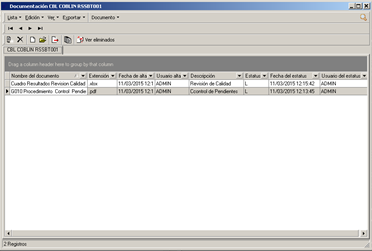 SysViewSoft Sys-Mining© permits the registration and loook up of documentation holding by users, this way, all system information is relocated in a central repository. The power of parsing is based in Matla©, powerful lexicographic analyzer of source code that manage any programming language in the parsing process. SysViewSoft have parsers for common programming languages, but you can incorporate easily any other. Facilitates the understanding of current application structure, based on common Windows elements, the user easily asSys-Mining©ilates information lookup. We use the graphic exploration tree at system level and navigating, drill down mode through the inner most element, data sets, copys, jcl cards. Every tree element can be edited in order to interpret with more precision. SysViewSoft Sys-Mining© must be constantly updated. That is a matter of precision and accuracy. Sys-Mining© have automated process to the accomplishment of this goal, accessing source code (mainframe), analyzing and collecting the updated or newly created elements. Also, the user has the ability to collect information depending on his necessities. With the purpose of printing documentation, SysViewSoft Sys-Mining© allows printing of the several lookups and additionally allows export the same information to other targets. The information placed on knowledge data base can be queried any time. You can schedule an automated process for collecting mainframe updated components information. The frequency of the process determines the accuracy of the information of knowledge data base. You have the possibility of printing online documentation related to application components in order to answer audit requirements. Fastest comprehension of systems structure. When you have more accurate information of the system, the user spends less time trying to understand the structure and operation of applications. All the time an application developer invest his time in components analysis for modification, mostly when exist a lacking of documentation. Sys-Mining© objective: reduction of this time, resulting in more productivity time . The generated documentation for systems and components, will be correctly integrated to dynamic documentation generated anytime, this way you have a unique centralized repository for information.